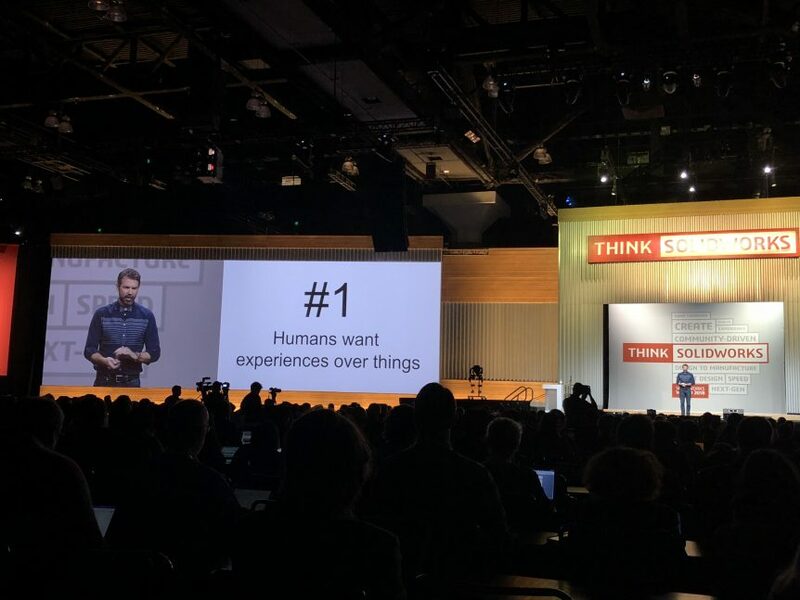 So said Brent Bushnell, keynote speaker on day two of Solidworks World 2018. Bushnell is the CEO of Two Bit Circus, an ‘experiential entertainment’ company that specialises in the use of cutting-edge technology to design micro-amusement parks and interactive games. A PT Barnum for the millennial age perhaps. His words struck a chord. Whilst CAD visualisations can be incredibly powerful and VR/AR are adding a whole extra level to the experience, there is nothing that quite replaces holding a physical model in front of your eyes. As such, we’ve heard a great deal at the conference about the idea of ‘art to part’ and how Solidworks can support the transition from the digital world to the physical realm as seamlessly and as swiftly as possible. Suchit Jain, Vice President for strategy and community at Solidworks, picked up the theme in his presentation on ‘Gap-to-Market’ thinking. He explained that Solidworks is interested in developing enabling technologies to reduce the distance between the digital and physical product – to help the designer or engineer move from a concept to a part in as short a time as possible. 3D printing, clearly, is one tool that can help as additive manufacturing can reduce some of the constraints associated with traditional manufacturing. However, 3D printing itself is evolving and Jain suggested that generative design capabilities will, again, remove barriers between an idea and a part. “We are introducing topology optimisation within the 3D Experience platform and we can simulate the 3D printing process as well,” he said. With regards to augmented and virtual reality, Solidworks is developing provision within the software as well as building partnerships with a range of VR companies. It was announced today, for example, that AR headset manufacturer Meta has introduced integration with Solidworks to allow users to interact with 3D CAD models in augmented reality. The hope is that such systems will be another powerful tool both in the design development process and in demonstrating design ideas to clients and stakeholders. “Gap-to-zero will come – we need to provide the tools for our users to experiment. Both Dassault and Solidworks are very research orientated and there’s a lot of stuff in research labs that we can’t show at the moment,” he added. Speed has always been of the essence in product development. However, in our ultra-connected world expectations around time to market are more demanding than ever before. The convergence of the physical and digital continues and – naturally – Solidworks is eager to be a facilitator in that journey.